Linea Nigra is considered as the Latin name for “black-line” and this darkened black line is located on the abdomen in women exactly between pelvic bone and belly button. It must not be black all the time, and you should know the facts about linea nigra whether you’re pregnant or not. That darkened black line comes from the hormone that stimulates melanocytes in a woman body. It is nearly a CM in length and goes belly button to the pubic bone in a straight vertical line. Depending upon the toning nature of your skin it lies between very light to the broad dark vertical line. It is not that much frequent in a fair skin woman or in the other women who gets it on their abdomen, but it is found that the linea nigra starts going away right after their delivery. Thus, this article will help you in every possible way to understand what linea nigra is and what the remedies for it are. The appearance of linea nigra in women is due to the increase of melanin percentage. With the increase of hormones there is an increase of melanin in the body and during the pregnancy of a woman, there is the rise in estrogen which is responsible for the Linea nigra darkened line. The increase of melanin may also occur in women if she is having birth control pills for a long time. Another reason for the increase of melanin in women is called as the Addison’s disease that caused by the adrenal insufficiency or failure. This is the primary cause of the appearance of linea nigra in women abdomen or the dark spots that appear in the different parts of the body. In such condition, you must need to undergo proper medical guidance and supervision. Do not ignore linea nigra as it may create many complications in your near future. If someone is having Polycystic Ovary Syndrome (PCOS), it can be considered as the reason for causing linea nigra as it is also on the list for creating estrogen dominance in the women body and for producing male hormones rapidly. You must need to consult your physician if you have linea nigra under normal condition. Depending on the nature of your skin tone, If someone exposed her belly to sunlight the more is the chances of appearing darker linea nigra on the abdomen. Linea nigra is nothing but a cosmetic issue and can only appear at the outermost part of your skin. The discoloration occurs. 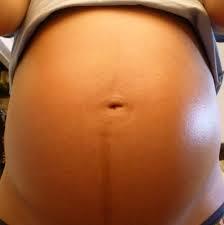 The situation when you need to worry about linea nigra is only when you get this darkened line being not pregnant. Such condition may arise for some other reason in your body, and as discussed in the above you need to consult your physician about Addison’s disease and PCO and soon get treated if something found positive among them. But if you have linea nigra by taking birth control pills, you need not worry about that and just follow the following steps that help you to reduce and face some of the discoloration from linea nigra. Cocoa Butter: Cocoa butter may not be that much useful, but you can easily find it online and is also very affordable in price. You can use the cocoa butter lotion in your linea nigra by rubbing it gently over the darkened line few times a day. Cover it up: If you have a plan to expose your belly, just try a cover up type make-up to cover your linea nigra darkened line completely but if you’re outing for a swimming session you need to re-apply it. Lemon juice or rubbing alcohol: These are considered as the natural skin lighteners and can be applied gently over the darkened skin part of your body. But before using it implement it on a small area of your skin to get the respond. Never use such lighteners who are corrosive to skin. Vitamin E oil: The best ways to get the positive results from it break open a vitamin E capsule and apply it gently to the stretch marks on your body. You can also use the lotion that is vitamin E enriched, but it may not be such effective. You can also consume the vitamin E capsules after being prescribed by your physician. Healthy foods: Darkened skin is the result of a deficiency of folic acid, and it can be overcome by eating nutrients that are rich in folic acids such as green leafy veggies, oranges, and whole grains. Reduce sun exposure: When you’re exposing to sunrise make sure that your belly is covered up or apply a sunscreen that contains, at least, SPF-15 in it.